Brilliant bathroom flooring spices up your living space. Bathroom Flooring is a very important issue that needs to be considered within a home. When choosing bathroom flooring, you have the same considerations as you do for flooring for other rooms in your house. Is it durable? Will it stand up to the children? Does it look nice or cheap and tacky? How does it feel under bare feet? These are the things you need to consider before you choose the ideal bathroom flooring options for you. However, the main consideration for bathroom flooring is, of course, moisture. While it gets points for feeling great under bare feet, the moisture problems are too many to explain and justify carpet as a suitable flooring option for a bathroom. Solid hardwood is a slightly better bathroom flooring choice than carpet. It looks great. It's warm under foot. But moisture is a killer for solid hardwood. First, you need to make certain that it's absolutely, perfectly installed, with no gaps for moisture. Because you want perfect installation, this likely means hiring installers. Contact a local Devon Flooring Installer for more information on installing a hardwood floor. You need the floor installed correctly. After installation it will need several coats of clear gloss or semi-gloss sealant to make it watertight. Surprisingly, laminate flooring is sometimes a better bathroom flooring choice than solid hardwood. The surface of laminate plank is actually a photograph of whatever it's supposed to be simulating: oak, cherry, slate, marble. On top of that is what the manufacturers call the "wear layer." The wear layer is a clear layer of melamine. But this wear layer is amazingly strong because as the seams are glued together, it's difficult for moisture to work its way downward. Laminate is easy to clean, too. But laminate still has that wood chip base, and should it happen to contact with moisture it will expand and bubble and the only way to fix it is to tear it out. Engineered wood is a great bathroom flooring choice. It has got a plywood base that holds up well against moisture. And it looks terrific because the top layer is real wood. If you want the wood flooring look in a bathroom, engineered wood is the best choice. No moisture problems with marble, granite, limestone, and the other stone flooring options. Stone is mid-level is this list and not at the top because of a number of issues. The first one is that it's cold. The second issue: it tends to be slippery. This can be solved by having the stone textured by sandblasting or buy purchasing naturally textured stone, such as slate. But the main issue that pulls this bathroom flooring option down, in my opinion, is cost. Stone flooring is by far your most expensive flooring option. Vinyl is the most popular choice for bathroom flooring for several reasons. Vinyl is very much a do-it-yourself job and there are thousands of style options. One downside of the vinyl tiles is that, after awhile, they tend to come up. Sheet vinyl is the solution to that, but sheet vinyl is more difficult for the homeowner to install. Furthermore, no matter how fancy the style and texturing, it still looks and feels like vinyl. Ceramic tile is the best of all worlds. Like stone, it's got a rich, textured, solid feeling. Like vinyl, it's waterproof and it's fairly inexpensive. And like wood flooring, it looks pretty good. 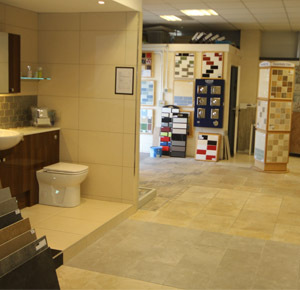 There are so many different types of ceramic tiles, you can get exactly the floor you want. You can even find ceramic tile that looks like stone. Mosaic tiles come in pre-mounted plastic mesh sheets, so you don't have to individually set each tile. And with tinted grout, you can be even more creative. It cleans up well and bravely resists even standing pools of water. The disadvantages of ceramic tile are like stone, it's cold. Also, it can be slippery. But texturing solves that problem. The smaller tiles are less slippery, because more grout is used with these tiles and the grout acts as a non-skid surface. The first and foremost thing to think about with bathroom floors is that it's going to get wet.